This time, I was determined to take the plunge. Due to my unease with being in a swimming costume (or more precisely, being out of one), I’d missed several opportunities to visit thermal pools in the past, including the onsens in Japan and the Blue Lagoon in Iceland. Budapest, famous for its baths, was my third time lucky destination – a chance to redeem myself for previously ducking out. I lingered by the entrance, my nerves compounded by my complete inability to speak the local lingo. As I knew nothing of the native tongue, I was relying heavily on the pity of English-speaking staff to guide me through the process. I stepped inside and let my gaze wander over the interior. 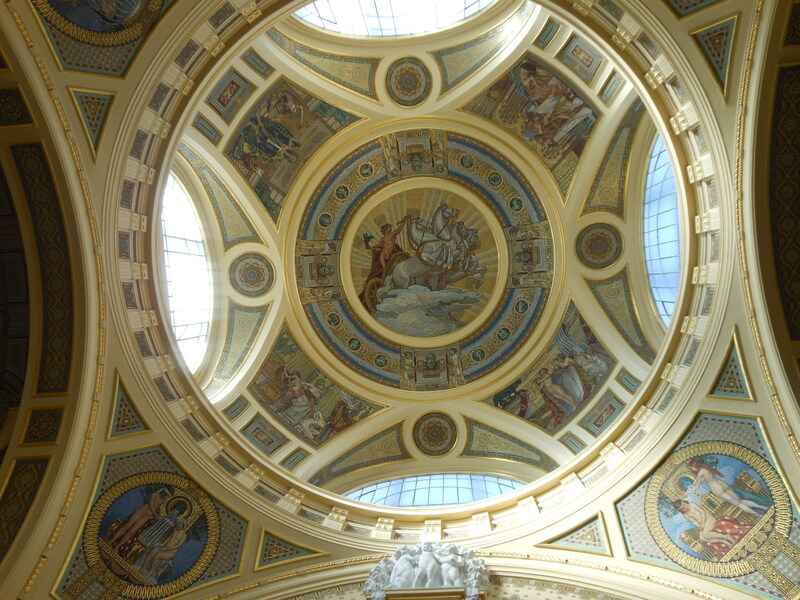 Decorated in a style reminiscent of the classical world, I marvelled at the mosaic displayed on the impressive domed ceiling. Spotting some visitor pamphlets, I made a quick beeline for them. I had been worried about not understanding Hungarian, when I really should have brushed up on my French – all the English maps had been taken. Fortunately, my woeful lack of language skills didn’t stop me from paying the entry fee and I picked the option of using of a private cabin. I changed into my swimming costume and (without further ado), set off clutching my towel, feeling very much like a fish out of water. I attempted to locate the outdoor pools, but it was a task easier said than done. There were pools everywhere – of all shapes, sizes and temperatures. The cooler ones were immediately discernible by the sheer lack of people enjoying them. In spite of the maps plastered to the walls, I struggled to orientate myself. 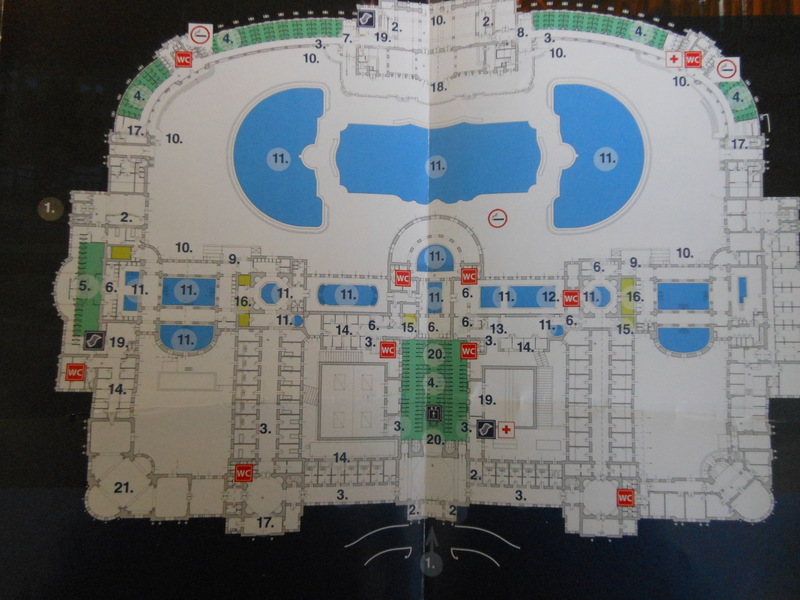 Navigating the corridors of the Szechenyi Baths was like entering a labyrinth – I was soon wishing I could leave a breadcrumb trail in the fashion of Hanzel and Gretel. Thoroughly lost, I tagged myself on to the end of a random group of friends, who promptly headed into the steam room. Awkwardly, I perched on the slick, hot stone, surrounded by people lounging on tiered benches. A faint dripping sounded in the stillness as water poured off my skin in tiny rivulets. Dark and humid, I imagined I was in a tropical rainforest at night. This was my first experience of a steam room, and once I’d adjusted to the initial strangeness, I began to thoroughly enjoy it. Finally, I felt myself relax. Yet I had not come to Széchenyi for the steam room. Explaining my dilemma to the group I’d gatecrashed, they kindly let me follow them to the outdoor pools. The air temperature was unseasonably high for October, allowing me to make a quick dash to the water without freezing solid. Sinking appreciatively into the warmth, I settled down for some serious people watching. Friends sat on the sidelines, letting fountains of water spray on to their backs. Couples cosied up as they basked in their pleasant surroundings. Meanwhile, older Hungarian men huddled in the corner, playing chess in a scene which was wonderfully eccentric. Outdoor pools – photo taken from the cafe. I took fewer photos than I would have liked, having learnt the hard way on my travels that cameras and water don’t mix. Staying outdoors, I moved to the opposite side of the Baths. This pool was cooler, and had more of a theme-park feel, with jets of bubbles bursting from underwater and a circular current for people to play around in. Shortly after, I made my way back into the building and explored some of the other pools I had passed earlier. That was when I found my favourite – at 40 degrees celsius, it truly felt like slipping into a hot bath. 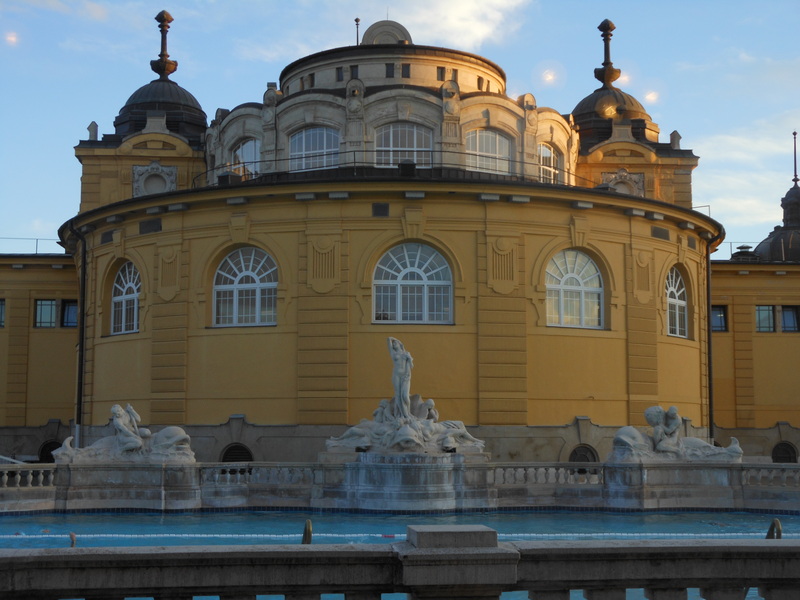 The aquamarine water was murky with minerals, for it originated from one of the naturally occurring springs in Budapest. Lined with terracotta columns, this pool resembled a Roman bath and was blissfully peaceful. I could have lazed there all afternoon, admiring the beautiful architecture. However, after almost three hours spent partially submerged, I was beginning to feel a little waterlogged. 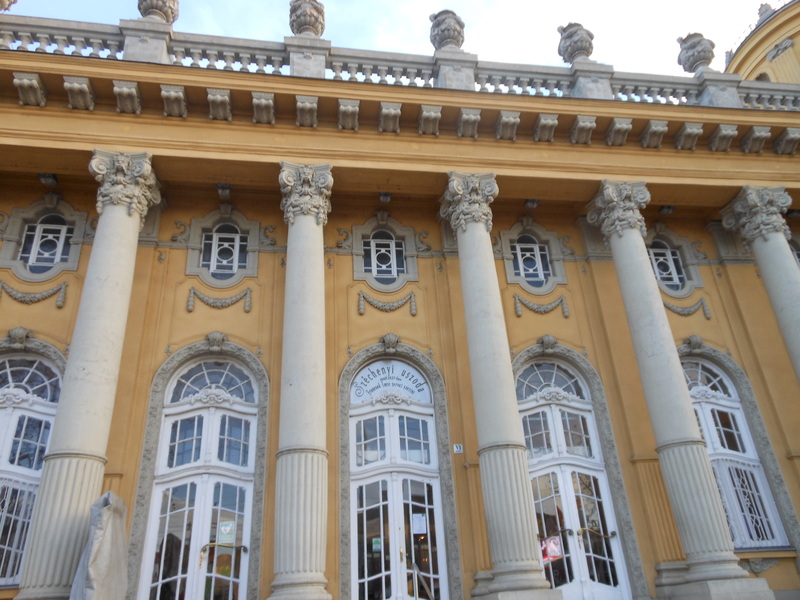 And so, with a twinge of regret, I left Széchenyi and took one last walk around the complex. Looking back, I’m glad I faced my fears and braved the baths. 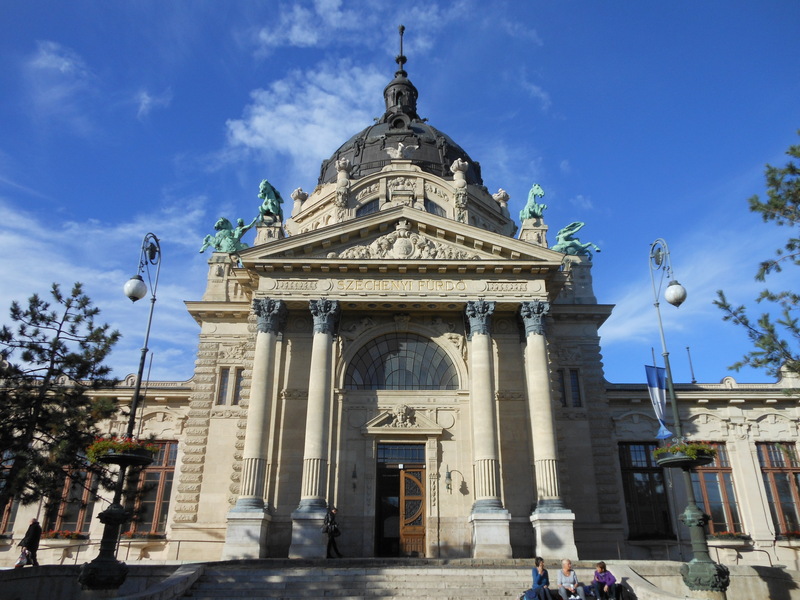 Soaking in the thermal waters of Budapest was a fantastic experience – one that I would definitely like to repeat in the future.